Kuentz-Bas is a renowned firm that until a decade ago was managed by two cousins. With great terroirs on the Grands Crus Eichberg and Pfersigberg they created well balanced and cellar-worthy wines in a dry and versatile style. Kuentz-Bas was a name which brought respect! But then came an anxious time. The owner duo split in disagreement over almost everything, the quality plunged. In 2004 the firm was taken over by J. B. Adam in Ammerschwihr which has introduced Trois Châteaux as organic product line. 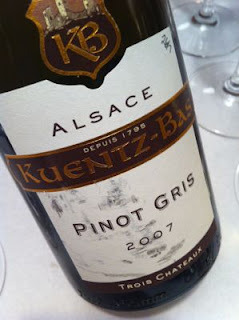 2007 Pinot Gris Trois Châteaux from Kuentz-Bas in Husseren-les-Châteaux are beautifully golden. The scent is powerful, with clear hints of fresh mushrooms, honey, smoke and apple pie. The taste is fruity with a rich mid-palate, fresh acidity and superb length. Kuentz-Bas is back in business! Price: €15.